Alterraun Verner played in 46 of 48 possible games in three seasons with Tampa Bay. 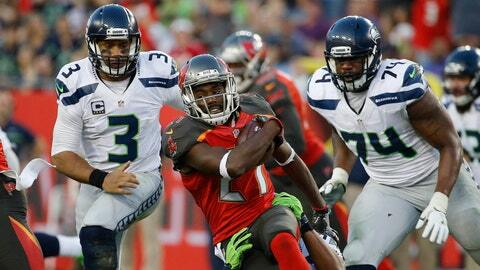 TAMPA, Fla. (AP) — The Tampa Bay Buccaneers released cornerback Alterraun Verner on Thursday. Verner, 28, played for the Bucs from 2014-16, appearing in 46 games with 23 starts, totaling 141 tackles, 20 passes defensed, four interceptions, three forced fumbles and a half sack. He was a high-priced free agent in 2014, leaving Tennessee for a four-year, $25.5 million contact. Tampa Bay will save $6.5 million in salary cap room with the move. Verner no longer was a starter last season, with first-round draft pick Vernon Hargreaves taking his spot. While with the Titans, Verner, a fourth-rounder in 2010, had 11 interceptions. He parlayed a 2013 Pro Bowl season into the big contract with the Bucs, but his performances never lived up to the deal.